I am very happy today. I woke up and remembered to say the prayer: “Thank you G-d for restoring my soul this morning.” Thank you for another sunny day in beautiful South Florida. My name is Jan Polatschek. I am Ruth Polatschek’s son. My purpose in speaking to you this morning is to remind us all of my mother’s contributions and accomplishments and to give those of you who did not know Ruth a sense of this creative and caring woman. Ruth Rebeka Lifson Polatschek was born on May 31, 1912. She passed away of complications of colon cancer at noon on Monday May 31 at her home - calmly, peacefully and with dignity. Many of you know Ruth as a show producer. If you saw her perform you know her as a show stopper. Did you know she was also a show disrupter? Can you picture a “Jackie Mason type” borscht-belt comedian? You know how it goes. They always ask, “Anyone in the audience born in The Bronx?” Hands go up. The comedian makes a wisecrack about The Bronx. Then, anyone born in Brooklyn? Same schtick. Then, G-d forbid, Queens? A wisecrack. After the jokes, my mother in the audience would jump up; proudly and defiantly she would shout out, “I was born in Fargo, North Dakota!” End of the routine. The comedian was just ambushed. What’s a nice Jewish girl doing in Fargo, North Dakota? My mother’s parents, Pauline and Harry Lifson moved to Fargo from Brocton, Massachusetts to avoid the flu epidemics. In fact they lost their firstborn child to the flu. My grandfather’s sister, Aunt Lena Kopelman, persuaded them to move to the clean air where my mother and her sisters and her brother were born. My grandfather ran a general store there. My mother visited North Dakota several years ago. The Kopelman Building still stands as a registered landmark in the town. My mother suffered many losses in her life. Her mother Pauline Lubitsch Lifson died in her 50’s. She was a relative of Ernst Lubitsch, the film director. My mother said she was a great cook and a marvelous singer. My mother’s father, Harry Lifson died at 74. His real name was Yehoshua Lifschitz. He emigrated from the city of Grodno in Eastern Europe but he loved America. He was a musician and a composer. He wrote a series of patriotic marches. He also composed “A New Salute to Israel.” He was a serious man and late in life he was a great greeting card and calendar salesman. One of his best sellers was the original Marilyn Monroe calendar. My mother’s sister Ida died suddenly at a young age. She was an accomplished pianist. Her signature piece was “Malagueña.” I remember my mother and Aunt Ida also playing jazzy duets. Their favorite was “The Carioca.” My Aunt Ida is my guiding spirit to this very day. I miss her. My mother’s brother Uncle Abe was not a well man and spent his adult life in a hospital. We visited him frequently. He was a soft-spoken and gentle man. My mother’s youngest sister was Beatrice. Aunt Bea was the real rebel in the family. She was full of energy and entrepreneurial spirit. Aunt Bea was a successful real estate broker here in Miami. She was also a great salesman. The story goes that she persuaded a woman to buy a small office building. A few years later the woman said, “Thank G-d for Bea!” When my parents retired to Florida, my mother expected to spend her retirement years with her youngest sister Bea. Unfortunately Bea passed away and my mother was heartbroken. My mother lost her oldest sister Sue and her brother-in-law Harry Taxier. Aunt Sue was most like her mother, a great cook but with a strong and competitive personality. Uncle Harry loved the Yankees and sat in the bleachers at Yankee Stadium on Saturday afternoons. “He swings like a rusty gate” was one of Harry’s many quips. My mother outlived all her sisters, her brother and her one brother-in-law. Most tragically, my mother lost her daughter, my sister Paula. At only 28, Paula died soon after delivering her only son Jason. My parents never got over that shock. Neither have I. My mother has suffered many losses. More than her share, perhaps. Now we have lost her. Recently, Jews around the world celebrated the holiday called Shavuot, or Shavuos, as we called it back in The Bronx. In our tradition, on Shavuot the people of Israel received the Torah from G-d. Our Bible, our book of learning and instruction. One commentary I have read called this event the moment when the Jewish people were wed to G-d. Since the Torah and the Ten Commandments have influenced most of the Western World, humanity itself, I think we can say that on Shavuot, mankind was wed to G-d. The Israelites stood beneath the mountain at Sinai; Jews stand beneath a canopy, the chuppah, at their wedding. At Sinai, G-d and the children of Israel signed a covenant. At a Jewish wedding we sign the ketubah, a wedding contract. We ate and drank at Sinai even as we celebrate at our wedding. The comment continues, when two souls are united and wed, when we are in love with each other, then we can know and love G-d. If being in love with another soul means being close to G-d, then Ruth was wedded to G-d in a dramatic way. Ruth loved everyone. Let’s be honest: some of us, me included, have stood beneath that wedding canopy more than once. Some of us have signed more than one wedding contact. Not Ruth. Ruth loved my father Otto and was loyal to him for forty-eight years, until finally they decided to call it quits. Ruth provided unqualified support for her slightly rebellious daughter and her somewhat lazy son, especially when we needed her most. My mother got me off the hook more than once. Ruth loved her only nephew Stanley Taxier and his wife Roberta and their children Donna and Jeffrey and their families. Ruth was devoted to her in-laws, Rosa and Herman Poláček. She unselfishly sacrificed for them when they arrived at the doorstop of our small apartment in the middle of the War. Ruth adored her sister-in-law, Ida Kiewe. When they were together, they were like sisters and best friends. Ruth idolized her grandson Jason Wiesenfeld and she loved his wife Carrie Berkowitz. She was so proud to be at their wedding last September. I wish you could have seen her that day. She was so beautiful. When I was a boy, everyone was welcome in our little apartment in The Bronx and our kitchen was always open. If you think I am tall, you should have seen the galoots I brought home from the street. My tall friends were always hungry and Oy Mamanyu, could they eat. My mother always fed them. Can anyone tell me where I can buy a good stuffed cabbage with white raisin sauce or a good spicy stuffed breast of veal or some warm date and nut bread that my mother used to bake? But my mother’s love went well beyond our home, our family and close friends. She loved the community. When there was a brief spate of vandalism at our local school, my mother led a demonstration of concerned parents to the 44th Precinct Police Station. Ruth was the president of the Parent Teachers Association at Public School 73 where Paula and I attended primary school. She was president the year I graduated. At the graduation ceremony she proudly handed out the diploma to me and to all my classmates. In her business career, Ruth was an effective administrator and manager. And she was always concerned for the people she came in contact with. When she was single, my mother worked for a shoe company that specialized in custom-made, comfortable “space shoes.” Those shoes were purchased and prized by many domestic workers. When her company expanded to Chicago, my mother was sent to manage the new concession that was located in a major retail store. The new shop was on the third floor. But this major retailer had a policy – Blacks were only allowed to shop in the basement. My mother persuaded the store management to a compromise – Black customers would be measured for their shoes on the third floor and would pick up the finished shoes in the basement. I don’t think the term existed back in the Thirties but my mother could certainly be called a civil rights worker of her time. More recently, my mother worked as a school secretary in an elementary school in Harlem - PS 125 on 123rd Street and Amsterdam Avenue. (Basically, school secretaries run the school.) One morning a very angry parent approached her desk. “Why am I called to the school? Doesn’t the teacher know I cannot afford to miss a day’s work?” My mother responded, “If the teacher didn’t care about your child, she would not have called you. But, thank heavens, the teacher is very concerned about your child and that is why she asked to see you.” The anger quickly disappeared. Later in her career with the New York City Board of Education, my mother taught courses to newly appointed school secretaries. She always emphasized what today we would call “good customer relations” - patience, understanding and kindness to the children, the parents and the teachers. G-d loved Ruth, and in her way and through her actions every day, Ruth loved G-d.
My mother loved to travel. 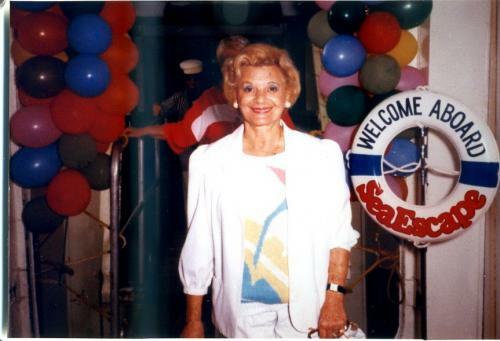 As a young woman she saved her lunch money and along with her close friend Esther Schneider, she was able to sail to France on the SS Normandie. This was a scandal of course. A single woman traveling alone? But my mother was independent and adventurous and she sailed to Europe more than once. For their Twenty-Fifth Wedding Anniversary, my parents flew to Europe. They visited my father’s home town in Germany and my father’s sister in London. It was always my mother’s ambition to visit her parents’ home city, now in Belarus, but I suppose that is up to me now. Certainly, my mother instilled her “wanderlust” in me. I will always be grateful. When my parents retired to Miami, my mother planned and coordinated many group tours for her friends and neighbors. My mother and father escorted groups to Europe, cruises to the Caribbean, and bus trips to New Orleans and Washington, and I can’t remember how many others. They seemed always to be on the road. And it didn’t matter what my mother planned. For many of “her people” as she called them, if Ruth Polatschek was taking a group, they just signed up. And she didn’t just take her people on trips; she entertained them along the way. When she didn’t entertain her friends on the bus, she entertained the passengers on the ship. She sang her songs, played her music and gave us all a wonderful sense of her music and her talent. My friend Larry Benowitz called me to tell me of his memories of my mother. Larry’s mother Lillian and my mother were friends in junior high school. Lil and Ben Benowitz and my parents have remained friends until this very day. Larry remembers visiting us in our apartment in New Rochelle. He recalls my mother singing her favorite songs at the piano: “Has Anybody Seen My Gal?” (Five foot two, eyes of blue…) and “If You Knew Suzie.” Larry was impressed with my mother’s energy and spirit as she pounded out the old songs. Did you know that Ruth also played the banjo ukulele with the spirit and energy of a flapper? Actually, I don’t think my mother could read music very well, or at all, but if you hummed a few bars she could play any song you requested. Here’s a contrast: Ruth’s son Jan would play Muzio Clementi and J.S. Bach, but Ruth would be playing “The Carioca” and Boogie-Woogie. Finally, the “Shows!” Always the shows. Who can count the number of shows Ruth wrote and directed? When I was a Cub Scout, and she was a Den Mother, there were more shows. One of them was called “It’s a Wonderful World.” It was such a hit that it made the front page of the New York Post, Bronx Edition. You could look it up. Along with the other members of my Den, I performed in that one too. When her Principal at PS 125 retired, Mrs. Polatschek wrote a show for Miss Ann Ruddy. When my parents visited Aunt Ida in London, Aunt Ruth wrote an impromptu show for Ida’s young grandchildren, Lisa and Paul Morris. Until Lisa wrote to me, I had no idea that this occurred. Lisa, now a young woman with children of her own, clearly remembers her performance with her late brother. How many shows did Ruth write? Shows we have no idea even existed? But her performers and her audience remember and cherish the memory of those shows. Here in Aventura, how many shows were there? Enough to entertain an entire city for many years. They provided laughter and entertainment to the audience. (Each show ran for at least four sold-out performances.) For her cast and crew, retirees all, the shows instilled inspiration, confidence and pride. “Nuts to You,” “The Tsoris Line,” “Lovers and Other Stranglers,” “Ravello! Ravello!” and many, many others were the titles of her musical shows that emphasized wit, satire and old-fashioned good humor. Adapted Music, Book and Lyrics by Ruth Polatschek. And sometimes, Original Music by Ruth Polatschek as well. How many retirees came out of “retirement” and for the first time in their lives learned to perform, to sing and dance on stage, to create make-up, sew costumes, and paint scenery? Thank you Bernice Diamond for your friendship and always wise advice and counsel. Thank you Laszlo Fecske for your friendship and support. Thank you Len Needelman, who despite your own inexplicable loss, found the strength and loyalty to be here for me. Thank you Lillian Gates for your devoted companionship, loyalty, friendship and support of my mother during these last years. Thank you to my piano students and their families who kept me in good spirits these last weeks and months. I want to acknowledge the doctors and nurses at Aventura Hospital, at Pembroke Memorial Hospital, and finally Aventura Hospice for their compassion, care and concern. Finally, my mother was blessed with a cadre of home healthcare nurses aides who provided her with absolute care and unlimited kindness for several years. Florence La Tartour, Thank You. Maude Lewis, you showed extraordinary bravery and humanity until the very end. Thank You. I am a teacher and not a Rabbi, but will you indulge me with a little preaching? My mother and I lived in the same high-rise condominium building for the last three years. My neighbors and her friends and her former cast members in Eldorado Towers would ask me on a daily basis, “How’s Mom doing?” I tried to be forthright then and must do so now. How’s Mom doing? Ruth was a great stage director. As her profession dictates, she is watching. We need to follow her lead and her direction. Starting today, even as we leave the parking lot and drive out on to our congested roadways, I ask you to please be patient, tolerant and courteous to our neighbors, even as Ruth was to all of us. And more, I ask you to find the strength and the courage to visit a sick person. I ask you to find the energy to pick up the telephone and say “How are you doing?” to someone who is alone. Next I ask you to sing to your children and to sing to your grandchildren and to sing to your neighbors’ children and your neighbors’ grandchildren. You will be inspired by the music you make and you will be inspired by the music you will receive, just as Ruth inspired you. Finally, I ask you to be generous to those who are less fortunate and need your help and your understanding. If despite all her losses, Ruth found the strength to be generous, we can do the same. Then we will all continue to be wed to Ruth and to be connected to her ideals. Most importantly, through our generosity, we will be united with our faith and our Bible and we will all be wed to G-d.
Ruth, you are a piece of history here, a piece of Aventura. I traveled with Ruth on one of her trips. It may not have been a deluxe trip but it was educational and delightful. I enjoyed every bit of it. We didn’t go to where the rich people stayed. We went to see where the people lived. That is where she took us. When we traveled in a country, we lived part of the country. It was something special. We also had something in common. My brother was a professor in Fargo, North Dakota. Ruth, we will always remember you, your smile your greetings your songs. And your son gave us a speech about you, Ruth wherever you are I know you can hear him. We are all proud of him and proud of your memory. I first met Ruth the first week I moved in, over twenty years ago. I called a meeting of a theatre group and Ruth was one of the original group. She proposed a show that she had already written called “Nuts to You.” She worked tirelessly for the theatre group. It was her dream to work on the shows. “Is it Rascal House or Morrison’s or maybe Burger King? We wind up in a fight. We will always remember Ruth for the lady she was, for the wonderful things she did for Aventura, for the many hundreds of people who laughed and enjoyed her shows. This is for me, as it must be for all who knew her, a moment of profound sadness. We have lost a very special lady. We mourn a noble spirit and a true woman of valor. Ruth Polatschek will never again enrich our lives with her sublime talent, her gift for bringing us joy and laughter. She will no longer greet us with her broad smile and her indomitable courage. How well I remember her asking me to play a part in a production celebrating America’s bicentennial. Her guidance, her sage advice, her encouragement will linger long in my memory. One had to admire her professionalism, and love her for uncommon graciousness. It is journey’s end Ruth and I bid you a fond farewell. I pray a loving G-d will take you in his embrace and that He will applaud your performance with peace everlasting. I first met Ruth when she ran an ad for a casting call. She was writing a show for the Sisterhood at the Temple. She asked me what I can do. I said I can do anything. She said, sing. So I sang My Yiddishe Mama, like a cantor. She said, Mr. Kaye, I want you for the show and I will call you. The next time she called me was five years later. She said are you Mr. Kaye? I said yes. She said are you the singer? I said I sold the Singer sewing machine last year. She said, no not that kind of a singer. I said who are you? She said, I’m Ruth Polatschek! I am going to do show and I want you in it. So we became friends. I went to her apartment and we sat at the piano. She couldn’t read the music but she followed me. Every song I ever sang, she was right there. I made a tape of one of her shows. You could see the life and the love she had for everybody. We went to the Waterways together. I brought along my song sheets. We sat down and started to sing. Before we knew it we had a mob around us. It was wonderful how people could relate to music. I am sorry to say that for the last couple of years I didn’t see Ruth, but recently I went to see her. Unfortunately she didn’t know who I was. But she started to sing her songs. She remembered her music. I loved that lady. She was my friend. May you rest in peace, Ruth. You will be an angel. You will sing to G-d. He wants you and that’s why He took you. With life’s adversities, Ruth kept on smiling. She was an upbeat person and spread happiness with her songs. Now Ruth is leaving us and going on to a new show with bigger and brighter stars. Make room Heaven for here comes Miss Ruth Polatschek! I knew Ruth more than forty five years. My late wife Gert and I were friends with Ruth and Otto in New Rochelle. We were neighbors and we belonged to the local beach clubs where on Saturday nights the men played gin and the women played mahjong. We had a group. Jan, I remember going to Paula’s beautiful wedding. Two years later I had to go to her funeral. We had a rough time but we lived through it. Now Ruth with will be with my wife. They will play mahjong together wherever they are. Jan, I want to say this to you. You are a great son, a really great son. You moved here and took an apartment near your mother and took care of her all the years she was sick. I commend you for his. I love you. I miss your mother. And Ruth, when you are up there with Gert, please remember me and talk about me a little bit. My husband and I moved here in the 1990’s, many years after most of you, so I don’t share the same background or memories as you do. How on earth did I become such a close friend to Ruth Polatschek? How did everybody in the building seem to know about the friendship? So many people asked about her or spoke to me about her during these difficult years. But for Ruth and me, it was not difficult. We met on a long bus ride. I didn’t know who she was, but it was like opening up the door to a little bit of heaven as friendship goes. We became close friends. We both had interest in music and dancing and in liberal politics. She was very compassionate towards all people and this drew me to her so much. I think this was one of the most wonderful additions to my life. You realize that I am not Jewish. I came from a Catholic background and I also came from a politically active group. I was part of the radical generation in this country. Many of you have spoken to me about that. But all of this was illuminated, was made happy and made wonderful by meeting Ruth Polatschek. It is very hard to say Goodbye. Yes, I am Ruth Polatschek’s friend and I am very proud to have had this addition to my life. Do you know hard it is for a Rabbi to sit still and listen to so many other speakers? I have listened very carefully to what everyone has said. As a Rabbi, I want to add a word or two about the significance of this day. I don’t believe in coincidences. There are certain things that are meaningful in the very day a person passes on. There is a prayer that we recite every day that has eighty-seven words in it. It is the pisuke zimra (with the letters p and z) or sentences of praise, sentences of song. The songs were written by King David in praise of the Lord. So eighty-seven has the significance of dedication of one’s essence, of one’s being, of one’s persona to service to other human beings and thereby, to service of G-d. It is significant the Ruth passed away at that time. Secondly I wanted to add that there is a legend found in our Talmud. It speaks of our Rabbi Meyer who one day found himself at the marketplace. To his surprise and amazement there was Eliyahu HaNavi, Elijah the Prophet. The Talmud was recording the message that such a one who brings enthusiasm and meaningfulness into the life of an individual thereby uplifting their spirits in a world that unfortunately has so much sadness, such a one that brings light and illuminates the darkness is deserving of the world to come. So it says in the Talmud. Finally, I want to add one other point. This coming Shabbat we read the section of the Torah that deals with the creation of the Menorah. The Menorah, the candelabrum is really the symbol of the State of Israel. It is the symbol of the light that came from G-d. The light burned perpetually in the Tabernacle and later in the Holy Temple. One section of the reading is “When you lift up the candles….” What does that mean? To lift up the candles? Our commentator Rashi says that when you light the candle you have to light it to such a degree that the light goes on by itself. You singe the candle wick so that it catches and goes on by itself. This is the role of a teacher, this is the role of a parent, this is the role of someone who passes on their spark and their fire to others. Someone once said that our tradition has more to say about osmosis than it does about Moses. Our tradition is something that is caught rather than something that is taught. This is also true about learning how to playing the piano, appreciation of music, of drama, singing, putting together shows – catching the spark of a person who has so much fire within herself such as Ruth did. Is it a coincidence that we are in Menorah Chapel? Is it a coincidence that here we have the menorah? Is it a coincidence that we read this particular portion on this particular Shabbat? I think not. I think that this is the message of Ruth Polatschek. A message of fire and spirit, not the fire of conflagration and destruction, but the fire of warmth and of beauty and illumination. And this spark has been passed on to her son, to those who came in contact with her, to her grandson and his wife, to all who are gathered here and to so many others throughout the years. It is a fire that continues to burn on, brightly, forever. It is an eternal flame, an eternal light. That is the message of the menorah, that is the message of the light of Ruth Polatschek That is the message that we heard here spoken so beautifully by so many people, especially her son Jan. The light will continue to glow and burn brightly, because each and everyone here has caught that flame. I know that G-d will bless Ruth as she finds a new life, a new light in her heavenly abode.